In the early 1960’s Dorothy Hinds Daugherty from Philadelphia found three kittens with four white feet each in a litter of Siamese. This unique color combination appealed to Dorothy and she began the process to establish a new breed. Dorothy bred the kittens to a domestic American Shorthair cat that had tuxedo markings and eventually the popular white V facial markings were developed as well. This breeding produced a new breed of cat that did not look like its ancestors but had a combination of the personalities of both the Siamese and the American Shorthair. The history of the Snowshoe cat was lost due to poor record keeping. Between 1960 and 1977, interest in this new breed of cat declined and in 1977 there was only one breeder left. Surprisingly though, by 1989 there were almost thirty registered breeders and in 1994 TICA accepted the Snowshoe as a championship breed. The Snowshoe cat is medium sized cat breed with mature males weighing between 9-12 pounds and mature females weighing between 7-10 pounds. This rare cat breed is muscular, powerful and agile. The body is moderately long and almost rectangular in shape. The head is triangular and the ears are medium to large. All Snowshoe kittens are born snow white. About 2-3 weeks later the point coloring will begin to develop and the head, ears, tail and legs will darken as the kitten ages. The body of the Snowshoe is a light cream color that darkens with age. The most common colors found are blue point and seal point. Due to specialized breeding, the lighter colors such as chocolate and lilac are less common. 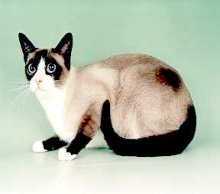 The eye color of the Snowshoe cat ranges from a pale blue-gray to a stunning blue. The coat of the Snowshoe is a single layer short hair coat. A weekly brushing is all that is needed to remove loose hair and to keep the coat healthy and shiny. 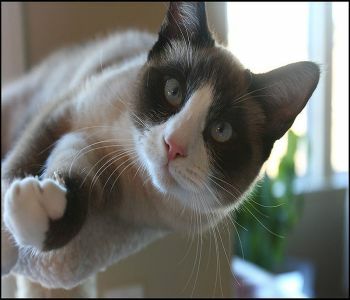 The Snowshoe cat has the personality and temperament of both its ancestors – the American Shorthair and the Siamese. This means that you have a cat with a unique look that is both curious and aloof. 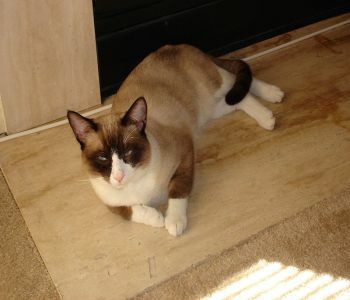 A Snowshoe cat bonds strongly with a particular human and will talk to this special person in a soft, melodious voice. They do however get along well with other people and other cats. This is a cat that demands attention and loves to be cuddled and pampered, but do not mistake the Snowshoe for a lazy cat. Games that stimulate their intelligence and inquisitiveness are appreciated.